Will “Mind-Blowing” Demographic Change Lead to Fiscal Disaster? Maybe future events will require a reassessment, but right now the biggest danger to the western world isn’t terrorism. Nor is it climate change. Or Zika. Or even Donald Trump. The real threat is demographic change. America’s population profile already has changed, but the future shift will be even more dramatic. But demographics changes are neither good nor bad. The real problem, as I pointed out last month, is when you combine an aging population with poorly designed entitlement programs. …even a small welfare state becomes a problem when a nation has a population cylinder. Simply stated, there aren’t enough people to pull the wagon and there are too many people riding in the wagon. That’s a recipe for a crisis. Here are some sobering details from a story in Business Insider. 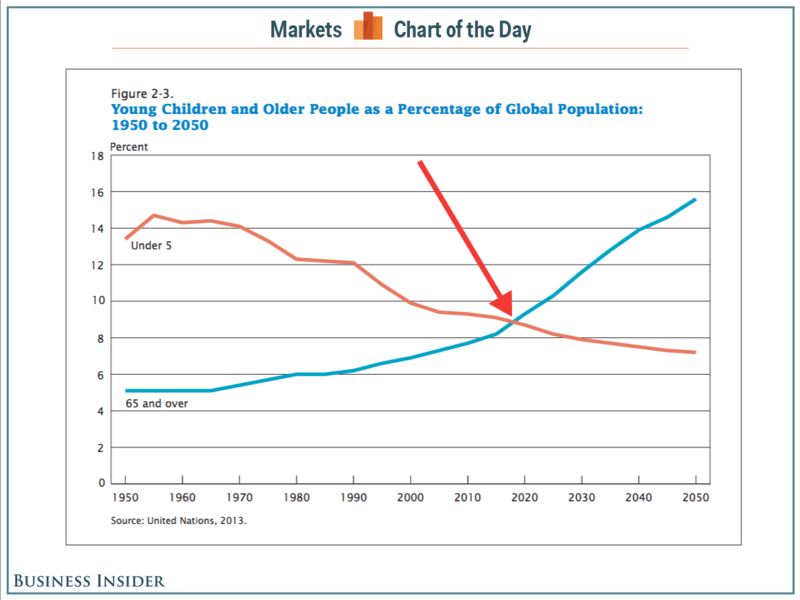 The world is about to see a mind-blowing demographic situation that will be a first in human history: There are about to be more elderly people than young children. 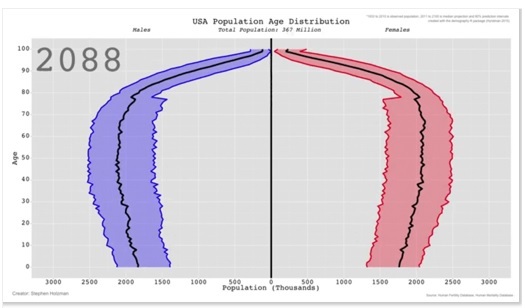 …And these two age groups will continue to grow in opposite directions: The proportion of the population ages 65 and up will continue to increase, while the proportion of the population ages 5 and under will continue decreasing. In fact, according to the Census Bureau, by 2050 those ages 65 and up will make up an estimated 15.6% of the global population — more than double that of children ages 5 and under, who will make up an estimated 7.2%. “This unique demographic phenomenon of the ‘crossing’ is unprecedented,” the report’s authors said. Here’s the chart that accompanied the story. And as you look at the numbers, keep in mind that entitlement programs mean that a growing population of old people means more spending, while a shrinking number of children means fewer future taxpayers to finance that spending. Let’s now look at a nation that is the “canary in the coal mine” for why changing demographics is a recipe for fiscal crisis. A story from The Week highlights the grim demographic outlook for Japan. Japan is us, and we’re Japan. …Japan has a…serious problem on its hands: The country is literally dying. According to current projections, by 2060 the country will have shrunk by a third, and people over 65 years old will account for 40 percent of the population. Already, the country is selling more adult diapers than infant diapers. To say this is unsustainable is a euphemism. The country is quite simply dying. …Demography is not destiny, exactly, but it is close to it. …the impending collapse can no longer be denied, as is the case in Japan and Germany. …The extinction of a people and culture is always a global tragedy. It’s time for Japan — and the West — to wake up. A wake-up call is needed. It’s not just Japan. The entire developed world faces a demographic problem. The good news is that there is an understanding that something needs to change. The not-so-good news is that many of the responses are misguided. Cheered on by the OECD, Japan has been boosting the value-added tax in hopes of financing an ever-expanding burden of government spending. And I’m not overly enthralled by some of the other proposals. Why not just pay people to have children? …If you lower the price of something, you will get more of it. Over the past two decades, Japan has spent trillions of dollars on mostly wasteful pork-barrel spending projects. It seems to me that the country would be better off today if that money had been spent on bonuses for second and third children instead. For what it’s worth, I agree that giving money to parents would have been better than the various Keynesian spending binges (some of which are downright nuts) that have taken place in Japan. But I’m not confident that child subsidies are an effective or desirable long-run solution to the nation’s demographic situation. The one option that would work is to reform entitlement programs. Hong Kong’s demographic outlook is even more challenging than Japan’s, yet it is in much better long-run shape because it has a more sensible approach to entitlements, including a private Social Security system. P.S. Every so often, a celebrity from the entertainment world has an epiphany about greedy and corrupt government. It definitely happened for Jon Lovitz, Will Smith, and Rob Schneider. And it might be happening for George Lopez. In a recent radio interview for BigBoyTV, comedian George Lopez let us all know that he’s endorsing Senator Bernie Sanders, while paradoxically, making it known he doesn’t want to pay any more taxes. Here’s what he specifically said. I endorsed Bernie Sanders. But really just to… I mean it’s cool. I can’t pay any more taxes, it’s ridiculous. But, so, we’ll figure it out. Huh?!? He’s getting pillaged by the tax code yet he’s supporting a candidate who wants giant tax hikes. I guess his epiphany needs more clarity. P.P.S. I admit these examples are all sarcastic, but Obama could have a Hollywood career after leaving office. Oh yes, and developed democracy voter-lemmings will have to see how many of the newborn slaves will hang around and stay put long term to serve their older progressive majority masters. Europe is already experiencing a significant outmigration of talent. Low income immigrants are coming in to strengthen the redistribution electorate and the competent are leaving. Does not look good. PS. Many of those competent Europeans are leaving for more promising lands wearing their very Che Guevara T-shirts, complaining that their European welfare countries are no longer able to take care of them. Go figure. In the end, reality has a way to impose itself even in twisted ways. Yes, but young people are already under economic stress. They need more help, more welfare, more HopNChange — not less. And that is what they’ll vote for. That is the way to address the population pumpkin. That being said, while the population pumpkin graph makes sense, the “crossing” inflection graph is purely artificial. It may have made sense as a pivotal point if all people died at 70 like clockwork, which obviously will not happen, even with death panels. The developed democracy economies may actually tip over even sooner. Crushed by their own progressive policies of high taxes, “smart (no) growth”, regulatory environmental taxes, the childbearing desires of the young will be crushed even further — as is already happening in Europe where people just can’t afford to have more children in their postage stamp sized eco-apartments, matchbox size eco-cars, energy excise taxes, high income taxes, and outrageous VAT. The vicious cycle of progressivism further stifling childbearing will bring implosion even faster than most people anticipate. Europe will implode sooner, but by the time it happens it will be already too late for America to turn back. How many voters will be willing to vomit out all the HopNChange they so enthusiastically voted for two decades? Europe is already sliding down faster than its brakes can arrest and the old continent is actually held up as a role model for America by a large percentage of the American population. You’re already toast folks! Show me an America which is the only western democracy able to pull back from the vortex — and then — I’ll believe in American exceptionalism. Otherwise it was just fortuitous historical serendipity folks — and guess what? — It’s coming to an end. There is no such thing as a properly designed entitlement program. No entitlements should exist, period.